holy smokes, is it deeeeelish! The basics are the same for all the varying versions of this salad, no matter what you fine tune it to your liking and tastes. You need corn, black beans and tomatoes. Your sauce starts with lime and olive oil, fresh garlic and a couple other spices. Then you start to build on it. Do you like green onions or red onions? Red peppers, green or yellow? Perhaps a combo of any or all. Do you want to add a bit of sugar to just take the sour edge off? You can’t go wrong with any of the choices, in my opinion and that’s what makes this salad a winner. I made mine chock full of avocado, green onions, 2 cloves of minced garlic, red and yellow peppers and sugar to take the edge off. My son ate this like there was no tomorrow and I silently rubbed my hands together with glee, seeing all that perfect protein being happily eaten without a fight. This is on the summer menu permanently! In a small container that has a lid, combine the first 7 ingredients. Put a lid on and shake it until it’s combined. 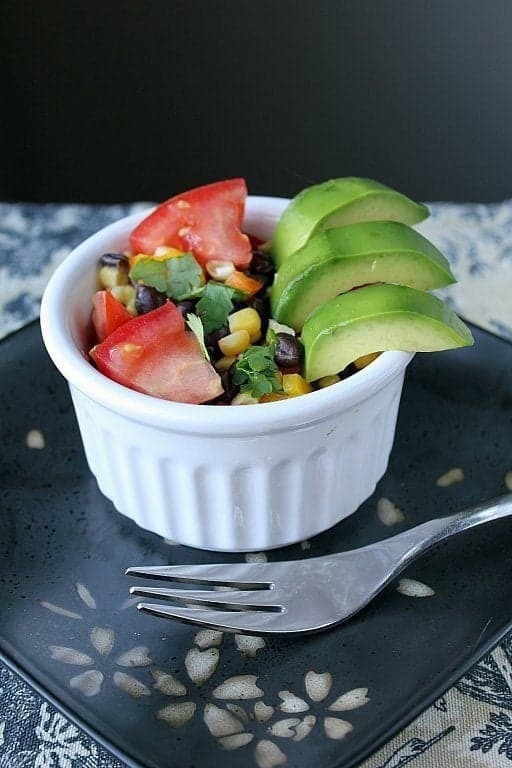 Rinse the black beans and corn, place into a bowl large enough to hold the salad. Dice up all the peppers and onions and toss them in with the beans. Now, if you are ready, and I mean NOW to serve that salad, chop up the avocado and tomatoes and add them into the bowl. Do not add these two ingredients until moments before serving, tomatoes weep liquid and avocados turn to brown mush. Chop up the cilantro and add it in. Pour the dressing over the salad and stir gently to cover all the ingredients and serve right away. Now I know that we haven’t had the best weather lately, but I promise, summer is coming and this will be perfect for a hot summer day barbeque. And to cheer you up this morning, I’ll share with you the fact that I am headed out on an all day field trip with my son and his class of grade 2/3’s. And then to make sure my suffering is complete and thoroughly meted out, we are taking another class of grade 2’s with us. Plus forty-odd, boisterous, loud, exuberant 7 and 8 year old kids. On a rickety, bouncy, jolting yellow school bus for 40+ kilometers. Amazing cold salad full of protein and healthy vegetables, a perfect summer side dish! In a small container that has a lid, combine the first 7 ingredients. Put a lid on and shake it until it's combined. 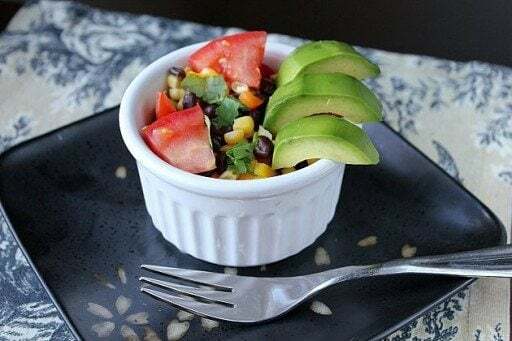 Rinse the black beans and corn, place into a bowl large enough to hold the salad.Dice up all the pepper and onions and toss them in with the beans. Now, if you are ready, and I mean NOW to serve that salad, chop up the avocado and tomatoes and add them into the bowl. Do not add these two ingredients until moments before serving, tomatoes weep liquid too much and avocados turn to brown mush. Chop up the cilantro and add it in.Pour the dressing over the salad and stir gently to cover all the ingredients and serve right away. i don’t like corn. What else can I substitute it with? Maybe leave the avocado out of the casserole, serve it sliced on the side! How did I miss seeing this recipe? This will be on the menu for next week for sure. It looks fantastic! PS-this is a great filler for a mexi casserole too. Layers of crushed tortilla chips, wilted spinach, this mix, salsa and of course cheese-baked until bubbly. Yummy. Yay you’re coming to my town!! !